Hereditary nonpolyposis colorectal cancer (HNPCC) is an autosomal dominantly inherited colorectal cancer syndrome attributable to mutations in one of several DNA mismatch repair genes, most commonly MLH1 and MSH2. In certain populations, founder mutations account for a substantial portion of HNPCC. 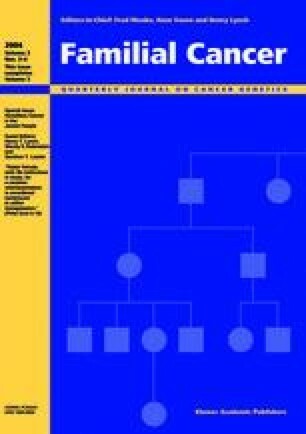 In this report we summarize the literature and our personal experience testing for a specific founder mutation in the Ashkenazi Jewish population, MSH2*1906G>C, also known as A636P. Although rare in the general population, the A636P mutation is detected in up to 7% of Ashkenazi Jewish patients with early age-of-onset colorectal cancer, and may account for up to one third of HNPCC in the Ashkenazi Jewish population. In addition, we summarize our initial experience with a prospective A636P testing protocol aimed at Ashkenazi Jewish patients at high or intermediate risk for harboring the A636P mutation.